A new way of looking at the world and our place in it. 1) A person who, by shaping people’s tastes and establishing a demand for certain foods, protects ecosystems and supports ecologically friendly farming practices. 2) A person who facilitates eating behaviors that are adapted what the planet can produce (and do so without habit destruction). 3) A person who is knowledgeable about our existing food production systems and how those systems strain or harm our ecosystems and who seeks out food producers whose practices are complementary or beneficial to ecosystems. 4) A person capable of directing the tastes of human beings towards food sources that aid the planet’s ecosystems or complement them instead of harming them; an environmentalist. 5) A person who makes, for farmers, the growing of ecosystem-friendly crops and ecologically-friendly farming practices economically feasible—and gives farmers confidence that there is a market for what they grow and produce. A chef can and will, for instance, develop a taste, among his or her customers, for ecosystem friendly forms of protein over steak, for example (as a steak is resource intensive to produce and the purchase of steak often contributes to deforestation, the use of feedlots and GMO corn monocultures). This behavior of chefs stands in contrast to cooks for whom the desires of customers and eating conventions (the use of imported beef or flour made from GMO wheat) take priority over the interests of ecosystems. Chefs possess the inclination and ability to interest human beings in things other than overharvested fish or energy expensive vegetables such as corn. For instance, a chef might make a dish using proteins with low energy to protein ratios (more efficient energy to protein conversion) or with perennial wheat varieties which are beneficial to the soil and often require no pesticides (as opposed to resource-intensive annual varieties, the majority of which are GMO crops that require heavy doses of pesticides and herbicides). In addition to influencing agricultural practices and eating behaviors, chefs can increase people’s knowledge about composting and food waste. What can you do? Here are some choices that are available to you. 1) Share this definition with others and be aware about our ability to advance our principles through our food choices. 2) Ask cooking schools to require courses in organic farming, soil health and cooking that requires only local, seasonal and sustainable ingredients—as well as ingredients with low calorie conversion rates. 3) Require that cooking schools be certified in sustainable environmental practices and require too that the schools accept no financial support from industrial agriculture companies. 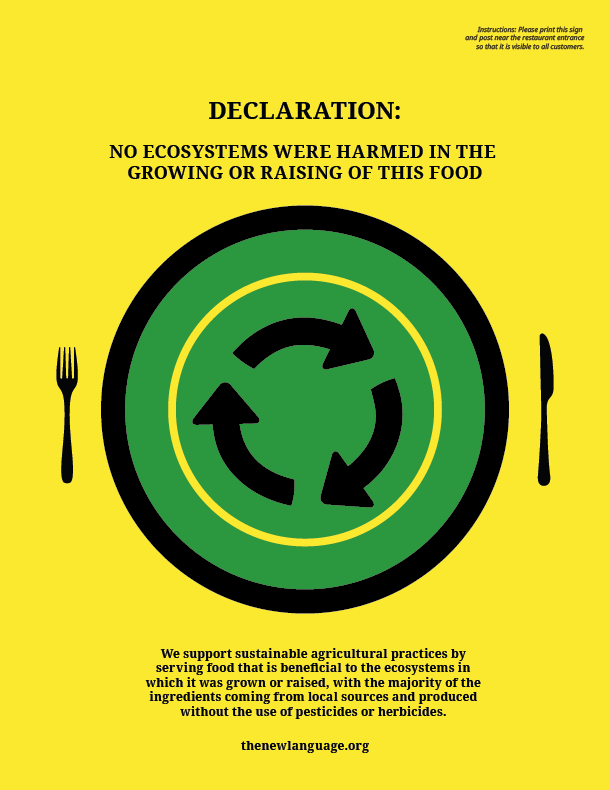 4) Support local measures and legislation that requires restaurants to place a sign in the window that declares its chefs use primarily local, seasonal, sustainable ingredients and grades the restaurant according to its environmental practices. 5) Cook and select food using local, seasonal and organically grown ingredients. Below is a pdf of the sign which can be downloaded and used by restaurants who follow these practices.